Gojjam (Ge'ez ጎጃም gōjjām or Goǧǧam, originally ጐዛም gʷazzam, later ጐዣም gʷažžām, ጎዣም gōžžām) was a kingdom in the north-western part of Ethiopia, with its capital city at Debre Marqos. This region is distinctive for lying entirely within the bend of the Abbay River from its outflow from Lake Tana to the Sudan. Gojjamis believe that they are the original people mentioned in the Bible as the river Guihon/Gihon (Nile, or Niger[see: Giehun, Sierra Leone] ) encircling the land of Cush extending to the ancient kingdom of Meroe. At the fall of Meroe to the Axumite King Ezana (4th century AD). 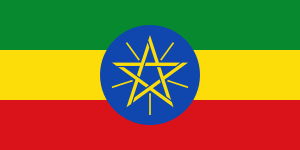 Gojjam (Guihon) became a kingdom and later joined the rest of the kingdom of Ethiopia having their own kingship up to the coming of Menlike II of Shoa in the late 19th century, who reduced it to a province. (Stigma By Prof. Muse Tegegne 1993 Geneva). The name Gojjam was given to the inhabitants due to their resistance in accepting the doctrine of the Alexandrian Church in the past, keeping their own version of the ancient testament, and respecting books like "Teezaze Senbet", the Book of the death of Moses, the Book of Enoch and that of the Psalms in Geez/Ethiopic version. (Stigma M.Tegegne). The ancient history of Gojjam is mostly associated with religion. During the pre-Christianity era Mertule Mariam and Gish Abay -in the eastern and central parts of Gojjam respectively- were places of worship. Along with Tana Qirqos on Lake Tana, the Axum Tsion in the Tigray, and Tadbaba Maryam in Wollo province, Mertule Mariam was a place where animal sacrifices were made for worship. Gish Abay is also considered a sacred place for being the source of the Abay River, also called Felege Ghion in Geez. Ghion is believed to be the Biblical name of the Abay River that is mentioned in the Book of Genesis as one of the four rivers which flow out of Eden and encompasses the land of Ethiopia. 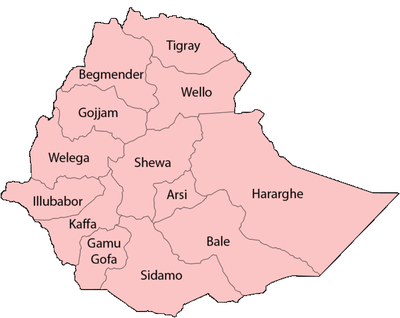 Considering its location within the bend of the Abay River, the province of Gojjam is also referred to, especially by the church community, as Ghion or Felege Ghion. The first church in Gojjam was built at Mertule Mariam, which became the second church in Ethiopia, next to Axum Tsion, and hence the second most important. Tradition relates that Christianity then spread from Tana Qirqos, Gish Abay and Mertule Mariam to different parts of the province. Gojjam then became home to some of the finest liturgical schools in Ethiopia. Other schools worthy of mention include Washera Mariam, Dima Giorgis, Debre Elias, Debre Werq, Amanuel, Tsilalo, and Gonji. These schools are generally credited for developing a sophisticated genre of expression called Sem'na Worq ("Wax and Gold") which is distinctive to Ethiopia. The earliest recorded mention of Gojjam was during the medieval period, in a note in a manuscript of Amda Seyon's military campaigns there and in the Damot in 1309 EC (AD 1316/7), during which time it was incorporated into Ethiopia. It was also referenced on the Egyptus Novello map, (c. 1451), where it is described as a kingdom (though it had by this time long been subject to the Emperor of Ethiopia). Emperor Lebna Dengel, in his letter to the King of Portugal (1526), also described Gojjam as a kingdom but one that was part of his empire. ↑ Donald L. Donham and Wendy James (eds. ), The Southern Marches of Imperial Ethiopia (Oxford: James Curry, 2002), p. 122. ↑ James Bruce Travels to Discover the Source of the Nile, selected and edited with an introduction by C.F. Beckingham (Edinburgh: University Press, 1964), p. 130. ↑ Gebru Tareke, Ethiopia: Power and Protest (Lawrenceville: Red Sea Press, 1996), at p. 167 enumerates two other occasions -- in 1942-44 and 1950. ↑ Zahru Zewde, A History of Modern Ethiopia, second edition (London: James Currey, 2001), pp. 216ff, and Gebru Tareke, Ethiopia, pp. 160-193.